Hurricane Nate’s winds were 90 mph Saturday morning and the fast-moving storm was expected to strengthen further to a Category 2 storm before making landfall overnight on the Mississippi Gulf Coast, and the city of New Orleans said it would be enforcing a mandatory curfew starting at 7 p.m.
Surveillance of Hurricane Nate showed it moving at a “very rapid” 25 mph through the Gulf of Mexico on Saturday morning, according to the National Hurricane Center. “While still uncertain, the latest forecast shows Nate strengthening and producing heavy winds and above-average rainfall in the area beginning Saturday afternoon through Sunday, October 8,” according to the mayor’s office. “The current forecast indicates 3-6 inches of rain over the duration of the system. Our greatest threats from this system are strong winds and storm surge. Because the storm’s greatest effects are expected overnight, Mayor Mitch Landrieu is issuing a curfew Saturday evening. 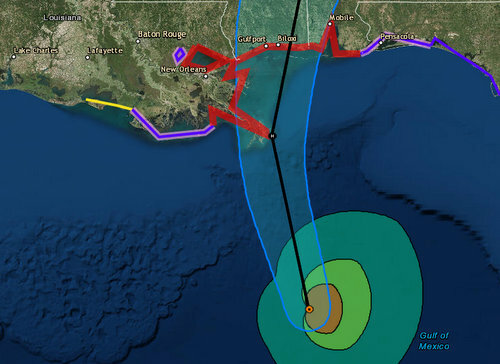 New Orleans police will begin barricading underpasses at 6 p.m. Saturday, and the curfew will begin at 7 p.m. and last “until the risk has passed” Sunday morning, according to Mayor Mitch Landrieu’s office. The city also issued a mandatory evacuation of the Venetian Isles, Lake Catherine and Irish Bayou areas. Let us not forget to check with our neighborhood churches to find out if services will be held. Catholics do not have to attend Mass if traveling to and from one’s church poses a hazard or if transportation is not available. The individual pastors have the option of cancelling Masses where and when necessary.